TransUnion’s 2019 consumer credit forecast includes a projected rise in subprime financing as a part of all of auto financing originated next year. However, the predicted rise still is expected to come in below the volume of subprime financing TransUnion spotted back in 2007 before the Great Recession occurred. 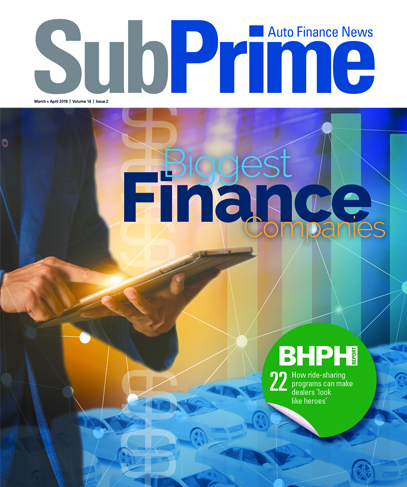 Analysts shared on Wednesday that subprime originations are projected to climb to 16.5 percent of all auto financing in 2019. That’s up from the expectation for how 2018 will close (15.1 percent) as well as the end of 2017 (14.6 percent). TransUnion reiterated that while the subprime climb is expected, the rise will fall short of the 20-percent level the industry generated 11 years ago. Delving deeper into the auto space, TransUnion acknowledged there are many factors that may impact affordability in the coming year, which could result in a slowdown in origination growth. The potential of rising tariffs could materially impact vehicle prices and consumer affordability. Furthermore, analysts noted that many consumers are purchasing and financing more expensive vehicles, such as SUVs and hybrids. Headwinds such as rising interest rates and fuel prices could also further impact auto affordability. Despite these potential challenges, TransUnion believes other macroeconomic factors such as low unemployment and an increase in GDP will continue to drive origination growth while keeping the average delinquency rate relatively low. Analysts added that it’s also worth noting that the number of auto financing originations is expected to end 2018 at 28.5 million and grow to 29.4 million in 2019. This is a significant increase from recent years (27.5 million in 2017, 28.3 million in 2016, 28.0 million in 2015). “This growth is expected to be driven from both ends of the risk spectrum,” TransUnion said. “Yet as the growth continues, the serious delinquency rate is anticipated to remain muted. Analyst pegged the serious delinquency rate at 1.44 percent by the close 2019, an increase from the expected 1.43 percent in Q4 of this year and the 1.43-percent mark observed in Q4 2017. “The auto-finance market continues to show signs of health and growth in many ways, said Brian Landau, senior vice president and TransUnion’s auto line of business leader. “We anticipate used-vehicle sales and auto refinance to be potential possibilities for consumers who cannot afford to buy new vehicles. Delinquencies have improved over the past several quarters and should that trend continue, we expect to see the market rebound,” Landau continued. Sometimes subprime auto finance customers also leverage personal loans. And TransUnion included that sector in its forecast. TransUnion said personal loans continue to display signs of strength, and total balances are expected to climb 20 percent to an all-time high of $156.3 billion by the end of 2019. Over the past year, analysts noted subprime originations saw a resurgence, which is expected to slowly rise in the coming year. TransUnion indicated originations will remain at “healthy” levels across all risk tiers due to more lenders participating in the personal loan market. TransUnion went on to explain the emergence of large personal loan lenders, and an increased focus by banks and credit unions on offering personal loan products, will keep growth steady. Even with growth expected in the subprime risk tier, analysts added overall serious delinquency rates are expected to drop 11 basis points in 2019 from the end of 2018 to finish next year at 3.39 percent. This is primarily due to maintaining a healthy mix of prime consumers on the books as lenders extend credit to subprime consumers concurrently. “Personal loans, whether for home improvement, debt consolidation or bridge finance, have reemerged as a staple of the American consumer’s financial portfolio,” said Jason Laky, senior vice president and TransUnion’s consumer lending line of business leader. “We anticipate origination levels to remain healthy across all risk tiers, and should the regulatory environment remain favorable, we expect to see continued growth from the subprime risk tier,” Laky continued. “The number of consumers with a personal loan will continue to grow in 2019 and could potentially outpace some of the balance growth we’ve seen over the past few quarters,” he went on to say. TransUnion highlighted low unemployment rates and continued positive growth in both GDP and real disposable income are among the key drivers that will propel the U.S. consumer credit market in 2019. Partly due to the strong performance of these economic indicators, TransUnion projected that originations and consumer balances are expected to increase for most credit products, while serious delinquency rates will likely decline or remain steady. “The consumer credit market has been buoyed by relatively strong macroeconomic factors this year, and our forecast sees more of the same in 2019,” said Matt Komos, vice president of research and consulting for TransUnion. “Consumer demand for both personal loans and auto loans is expected to remain high, and lenders are expected to continue looking to expand their books of business by providing more subprime and near prime borrowers with loans. This is a positive for both lenders and consumers. “Delinquency rates remain at either low or ‘normal’ levels, and lenders have confidence to open up their portfolios to slightly more risk,” Komos continued. “From a consumer perspective, subprime and near prime borrowers accessing new credit will now have even more opportunity to showcase that they can responsibly manage their payments. “We anticipate the trend of managing risk exposure through loan amount and line management strategies for these higher risk consumers will continue into 2019,” Komos went on to say. TransUnion is hosting a webinar at 2 p.m. ET on Thursday to discuss its forecast in more detail. Registration for the event can be completed here. Editor’s note: An upcoming episode of the Auto Remarketing Podcast will feature TransUnion’s Brian Landau discussing 2019 projection. Our library of past episodes is available here.